In order to guarantee nature conservation in a country as unique as Peru, there is a need for a diverse and technically solid team. WWF Peru is conformed by a multidisciplinary team that combines specialties that range from geography, to marketing and indigenous affairs, including the different sciences linked to nature conservation. 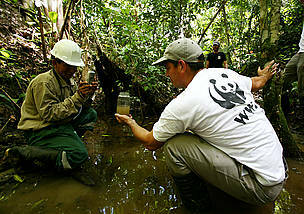 WWF Peru contributes towards the sustainable development of Peru, channeling most of its efforts through national and local partners, sharing its experience through the generation of valuable scientific and technical information on our biodiversity and the creation and supervision of innovative conservation tools.